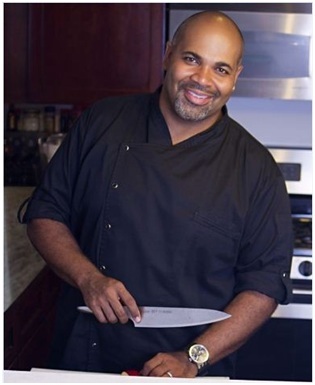 Chef David Blackmon has been a professional in the culinary industry for 19 years now, and currently works as the Program Administrator for Hospitality, Culinary Arts and Agricultural Sciences in the Chicago Public School System. His style of cooking has been known to have multicultural influences, including Southwestern, Italian, Southern and Asian. As October’s Chef of the Month, Chef David was happy to share some of the wisdom with us that he has gained over the years with his experiences in the field. Below, find our interview with the chef. To learn more about Chef David Blackmon, visit his website: www.chefdavidblackmon.com. In high school, I used to sell homemade cookies. I got a lot of good comments from people about them. Plus I found out it was a great way to get a girlfriend. So I pursued it when I graduated. Culinary schools can be very expensive. I recommend that you try working in a kitchen for free (unpaid) to see if it fits first. If it still feels good, then go get professional training. 3. What would you recommend as far as on-the-job training? Seek out and learn as much as you can from the best chef you can find that cooks the way you want to. Be humble. 4. What is your greatest challenge in getting the ingredients you need? I live in the Midwest, but love to cook with Seafood from Coastal regions. So getting them without all the up charges has been challenging. Man, I wish crabs and lobsters would grow in Lake Michigan!!! 5. Has the price of energy and fuel affected your industry? Yes it has. I fold the fuel charges into my food cost. I also joined a local CO-OP that increases my buying power for “green” cooking technology to add to my kitchen and save on energy. 6. Do you see new dining trends surfacing? 7. What fabric and style of chef coat do you enjoy wearing the most? Style# 67518 in black with the roll-up sleeves, and Style# 63313 in white and black – when I want to get all fancy! 8. Do you enjoy dining out on your free time? Yes of course. I enjoy Sushi and Korean BBQ. 9. Do you try to experience your competitors’ food? Do you ever get ideas from them? No I don’t. I don’t mind saying this but my product is better than theirs. LOL!! I have a standard order for rotational inventory. But also like to visit the markets. I draw my culinary inspiration from what I see there, plus I get a chance to form face to face relationships with the vendors and farmers. 11. How do you test a new recipe without putting it on the permanent menu? First the kitchen staff, then I run it as a special, go out and touch the table to speak with the diners on the dish. 12. Do you notice any resistance to the unhealthier dishes? No. Butter, Fat and Sugar still rule my kitchen. But I do preach eating food in moderation. Try to incorporate costly protein items across the menu to 2 or more items so they don’t go to waste. Cook with your heart. If you put love into your food, it will be adored by others. 6 Cooked Catfish fillets, cooled, roughly chopped. 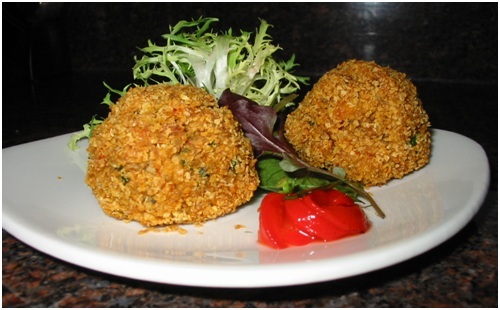 Mix first 9 ingredients and form into mini patties with 2 oz scooper. Roll in Corn flake crumbs. Refrigerate until firm, about 1 hour. Bake in 425 oven about 8 minutes until heated through. Serve with Fruit Salsa. Yield: 50 Pieces. ← First Day of Fall, Have Some Ice Cream!